Nottingham House is a modern home with Scandinavian style furnishings remodeled to accommodate visitors to the lovely city of Fairbanks. The home has two VRBO units, one upstairs and one downstairs, which can be booked by one group or two separate groups. See Nottingham House Upstairs VRBO site for description of the other three bedroom/ two-bath upstairs unit. Together both units will accommodate 14 people. Owner and master carpenter Bill thoroughly soundproofed the two units for maximum privacy. 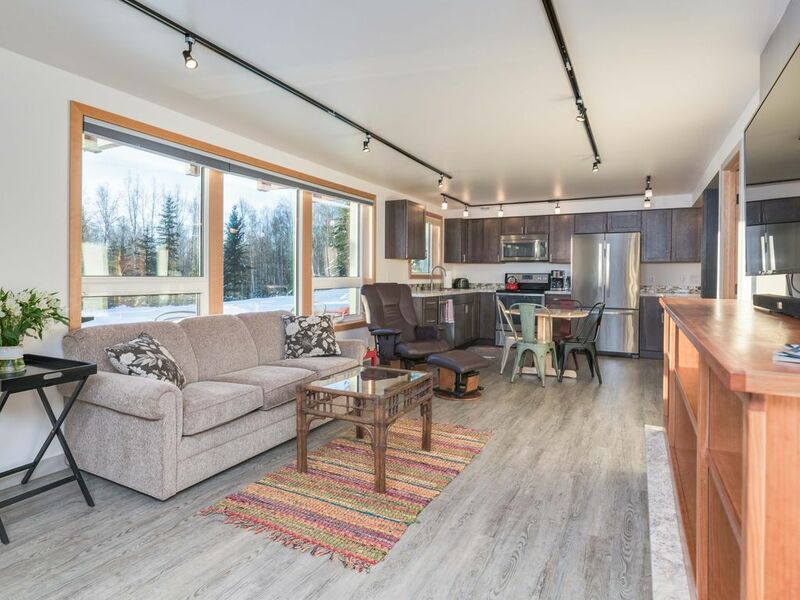 The Nottingham House is located in the hills above Fairbanks, providing a quiet private location that is easy 15 minute drive much of Fairbanks, including downtown, University of Alaska, Pioneer Park and the airport. The downstairs unit can accommodate 6 people and is completely a standalone unit with three bedrooms, two bathrooms, open kitchen and dining area and washer and dryer. The downstairs unit has three beds. The large master suite has a queen bed, tiled bathroom and has a private sitting area with pull out full bed that can be walled off with sliding pocket doors to create private second bedroom. Another tiled bathroom services the third bedroom, with queen bed, to accommodates the rest of your family. Kitchen is fully stocked with amenities and small appliances for preparing your meals. Contemporary, open kitchen and dining room invite warm family gatherings. The tiled showers and bathrooms are elegant and spacious. With its prime location and amenities, the Nottingham House is a perfect place to stay while visiting Fairbanks with your group. Up to 14 people (8 upstairs and 6 downstairs) can stay together in our lovely home. This VRBO site is only for the downstairs unit. If you are interested in both units send us an inquiry for discounted rates. Longtime Fairbanks brothers Ben and Bill have remodeled this lovely home in 2016. Bill is the master carpenter whose skills bring this lovely home to you. Bill is a gracious host who will go out of his way to help your stay be wonderful. The Nottingham House is an irresistible property in an ideal location. Visitors will love their stay here. The property located in the wooded hills and yet is close to everything. Large groups of 6, 8 or 14 can all stay together. Aurora viewing is amazing. Get away from the hustle and bustle of hotels and town. Relax and spread out with your family in an affordable luxury vacation rental. Very clean and spacious. Apartment is completely updated. This is a very quiet peaceful setting. The apartment has everything you may need. It is a fabulous VRBO. You will not be disappointed. Process was easy and owners were available for anything leading up to our stay. This was our second time staying in one of Bill’s rental homes. We enjoyed our stay so much. Not only was the house beautiful, but we felt right at home. Bill thought of everything we could possibly need. We will stay here over and over!! Thank you so much Bill for a wonderful Stay!! Bill was awesome! Was available when/if you needed him. He went above and beyond! What a great place. Very clean, comfortable and has everything you need for toiletries and towels. It was in a great location. Close to town, but not too close. The furniture was comfortable and so were the beds. Well worth the money. Just a fantastic place. My family and I were looking for a remote, quiet place near Fairbanks for three nights in early fall. We felt that we found this to be gem of a property. Everything about it was immaculate. I concur with other reviewers that the house appears even better than what it does on the photos. The house was very clean. At the time of check in, it felt like we were moving into a brand new house. We cannot think of any negatives for our stay. Will definitely visit again and would recommend this house to anyone visiting Fairbanks. Clean, modern, ample amenities, quiet, peaceful and well appointed. The host was very responsive to our needs. Great property! Great location & lovely house! Loved staying here. Bill was a gracious host , & gave great suggestions!